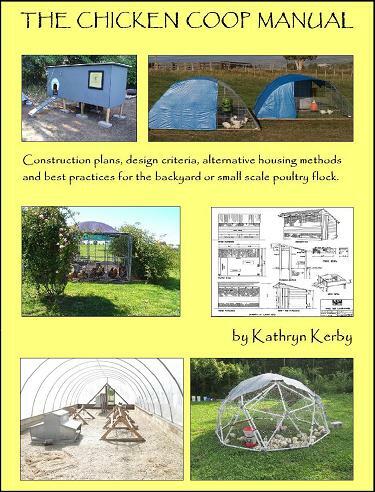 A comprehensive guide to small flock housing, for backyard chicken flock owners and small scale commercial operations. When we started our flock, we looked in vain for chicken coop plans. Most poultry books discussed breeds, feeding, health, egg production, etc. But none of them offered detailed coop plans or options. At most, they offered a page or two of general housing information, as if "one size fits all". We built our first coop in that vacuum of information. We quickly learned that first shelter was far from ideal. Then we built another coop based on what we'd figured out so far. That one did better, but still we had some lessons to learn. More than a decade later, and several coop designs down the road, we've learned a lot about how many different issues affect poultry coop success. Section IV provides a wide range of additional resources, such as books, websites, and articles which all touch on flock housing and management. People who want a small poultry flock, but weren’t sure what sort of shelter they’d need. Folks who already have actual chicken coop plans or firm design ideas, but had specific concerns about design details. Individuals who must comply with local regulations, zoning or neighborhood covenant rules and must choose a coop that will meet those requirements. Mentors for ag-related youth clubs such as 4H and FFA, and want a comprehensive guide to help students/participants design and build coops which will function well. Local or state regulators who are tasked with updating regulatory code for small scale poultry ownership within their jurisdictions, and need a guide for best-practices housing, waste management, disease control, and pest control. The PDF format is 83 pages long, 8.5" x 11" size, full color, with a hyperlink Table Of Contents. The PDF file will be available for instant download as soon as payment is confirmed via Paypal. Note: After you have received confirmation from Paypal that your payment has been successful, you will see a hyperlink on the Paypal page for "Return To Frog Chorus Farm". Click that link to go to the instant download page. If you leave the Paypal page without clicking that link, please Contact Us so that we can send you the link manually. That followup may take up to 3 full business days. We are delighted to offer our book in both Print and Kindle format via Amazon.com. All we ask is that folks post a review of our book once they've read it. The price will vary according to format and condition (new vs used). Note: If you would like to order a case of printed books for your school, 4H/FFA club, feed store, poultry club or other group, please Contact Us for wholesale pricing. We sincerely hope that new flock owners will find answers to all their chicken coop questions within this manual. We hope that they share with us their eventual chicken coop plans, and how well those plans worked for them.